I have been obsessed with the ombre style recently, and since it has been getting warmer I figured why not make an ombre tank?! Good idea, right! Okay so here it is! 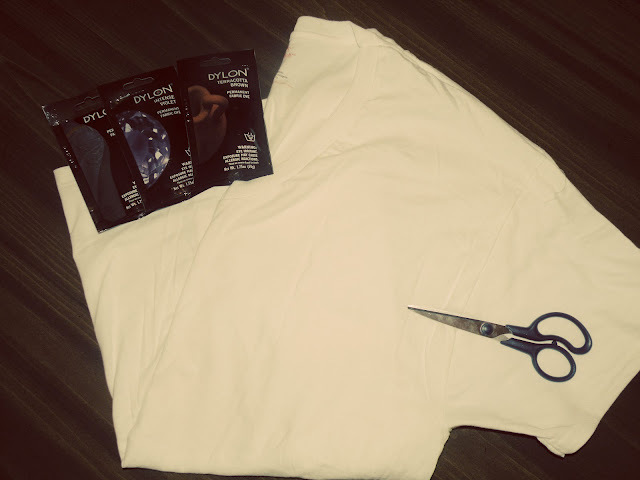 Fold the tee in half so the sleeves, neckline and ends line up. and mark where you want to cut. Cut the sleeve off and close to a v-neck neckline. Remember you can always cut off more later, so don't go crazy at first! 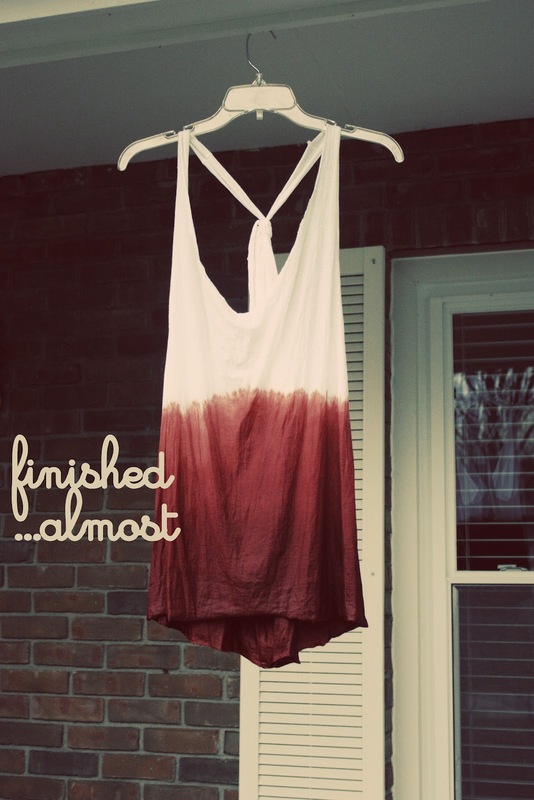 Unfold the shirt and look at your almost done tank! I pulled and rubbed along where I cut to make the cotton look more work, but that will also come with time! I also cut off the hem at the bottom, but you do not have to do this. Keep your sleeves!! 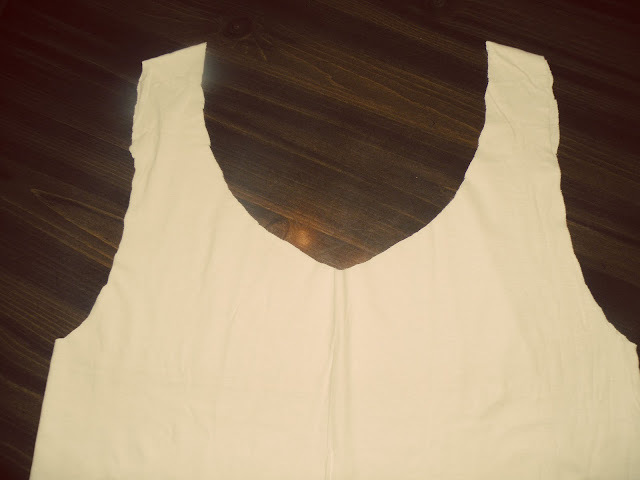 Cut a couple strips from the sleeves and use them to tie the back of the tank together. I had my sister try the tank on and tie them while she was wearing it so I got it right. Here's the finished tank! Next is dying it! (My favorite) Prepare the dye according to the manufacturer's instructions, mine used about 4 cups of water, 4 tablespoons of salt and the dye. 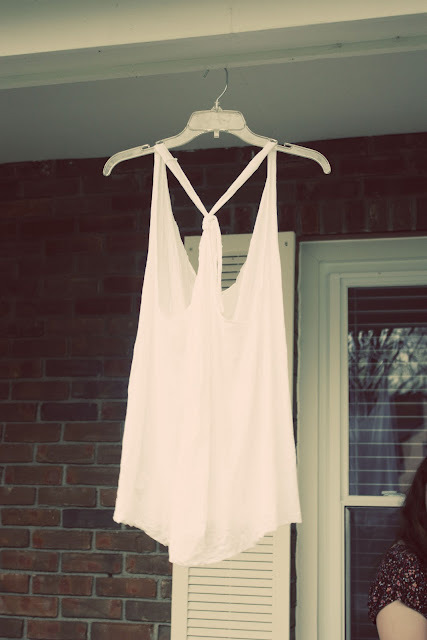 Dampen the fabric with warm water for the best dying. 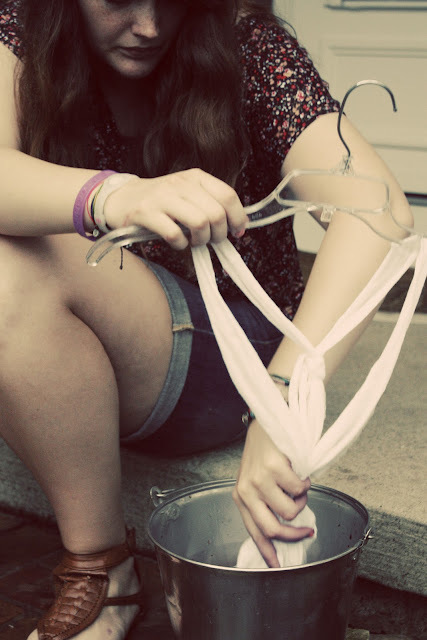 Put the tank on a hanger and dunk half into the dye. I held the bottom of the tank in the dye longer to get a gradient effect. Squeeze out some of the extra dye starting at the middle of the tank (the top of where the dye is) and all the way to the bottom. Don't hate on my makeshift glove, haha! 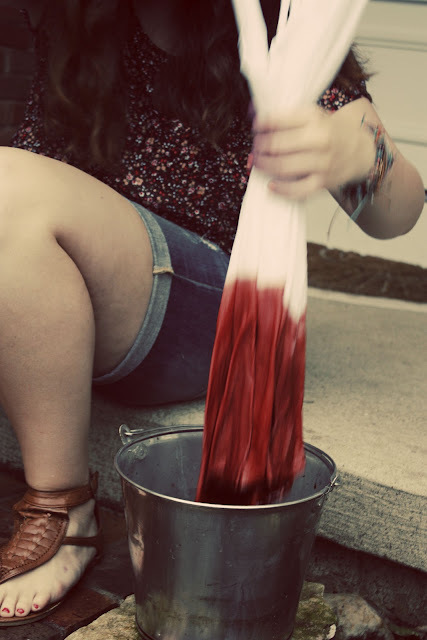 I say almost because this was right after i dyed it! Let the tank sit until the dye dries (mine ended up being over night) and iron the dyed part so it sets. Wash in cold water and wear! Have any questions, comment below and I hope you like it! And thanks to Michael Maurer for taking photos for me!! 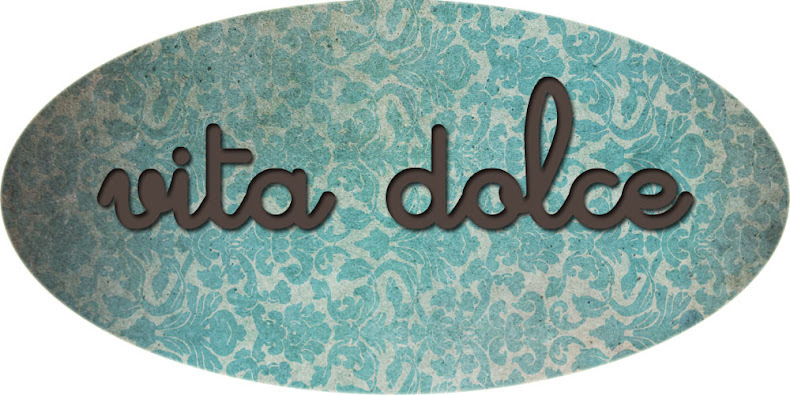 I liked your other DIY and pictures are excelent. thank you. I'm going to do this! Thx! Any way of dyeing the top a diff color? Turn it upside down and dip the top in dye? what color dye did you use for your shirt??? 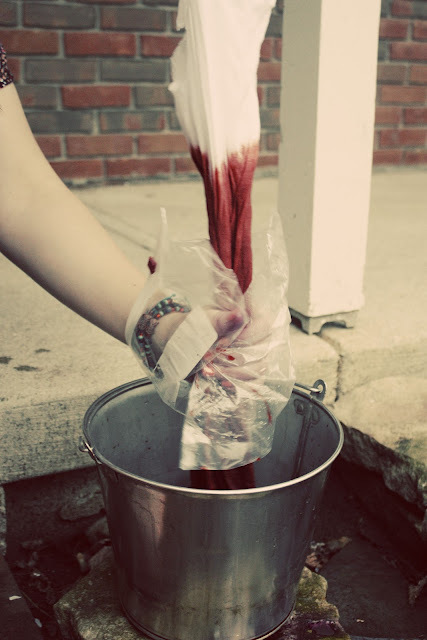 I think from what I remember from buying fabric dyes, it looks like Dylon's 'menstrual maroon". Whatever you use though, make sure you don't accidentally get a set-in-machine type (which dyes whole garments, and can't be used to dip-dye). Wow looks great! What color dye was used for this? so cute!!! I tried and it worked! looks really cute with strapless bra! Made one today, turned out really good!! Thanks, your pictures helped alot! 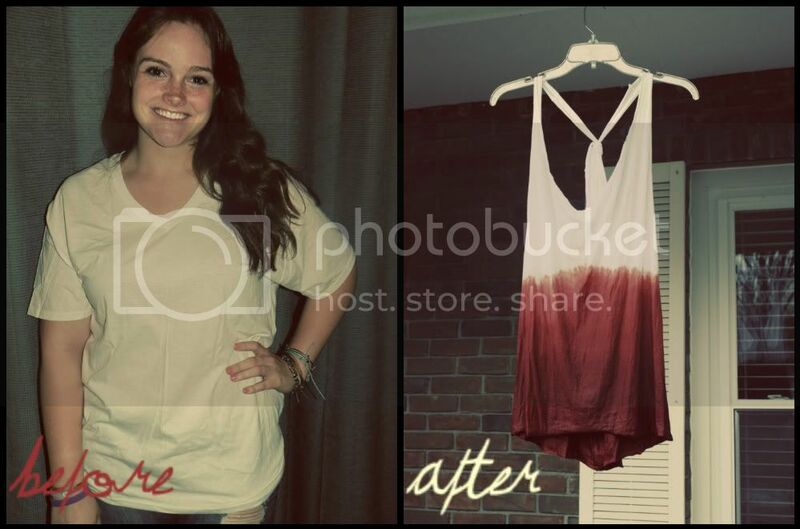 i made one last summer with a dry shirt and the dye bled up the shirt as the shirt dried. 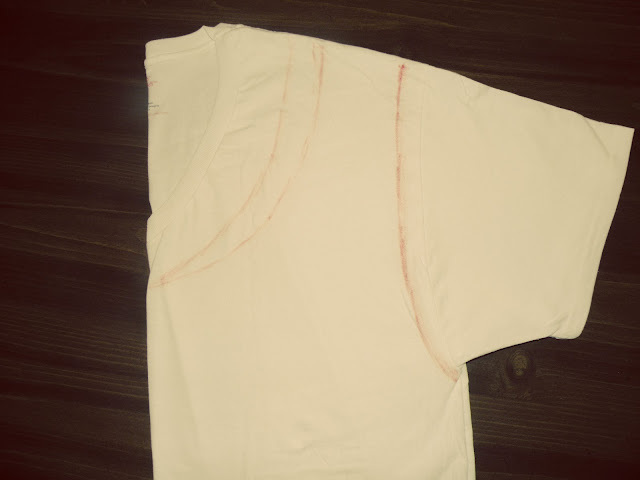 i tried again with a wet shirt and it bled worse. any tips? I accidentally bought my husband a 3 pack of white men's undershirts that were too small for him and they are just waiting to be made into something cool. I am totally going to jazz them up by dying them this way. Thank you! did you make any other cuts on the back of the shirt? 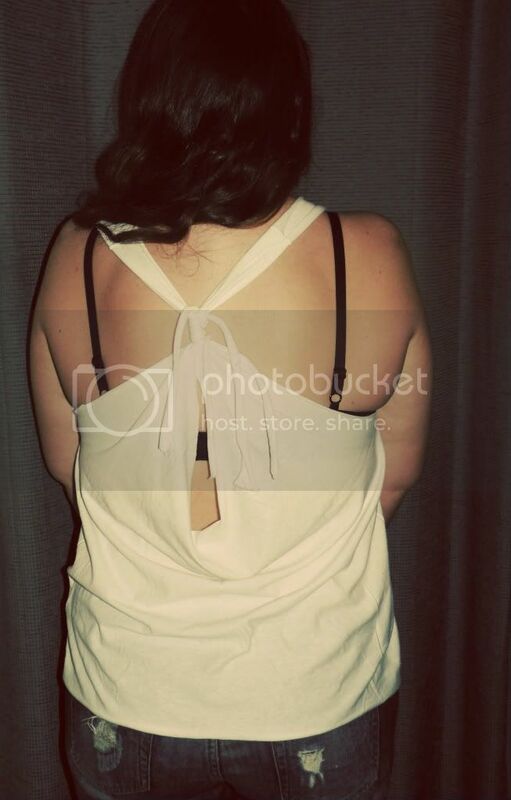 I like the little keyhole on the back but couldn't cut mine to make it look like that. Can you show or describe more of how you cut it to create this look? would really appreciate it!